Colva Beach the lively and bubbly movements of the sea waves make the sea look like it is dreamily enjoying the tickling vibrations spread by the waves riding over it. This is how you can describe the sea at Colva beach. 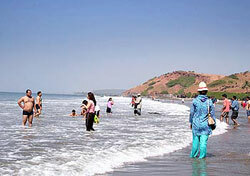 You have to go to the Colva beach to experience the sheer laidback waters and relaxed environ. To make your visit more interesting, just gather your compilation of favorite books and head for Goa's Colva beach. You can spend the day relaxing on the shore, reading the books with just the sighs of the sea to perturb you. The Colva Beach skillfully manages to keep its serene and peaceful landscape intact. The Colva beach in Goa has gained popularity recently. Colva beach is one of those beaches in this small Indian state of Goa that is developing at a very rapid pace with the advent of many hotels and resorts in the nearby areas. There are a number of shacks lined up along the Colva beach that offer you delicious Goan cuisine along with innovative cocktails. You can relax in one of those shacks and savor the mouth-watering food that is served while looking at the cosmic sea in front of you. The Benaulim Beach is located approximately 2 kilometers away from Colva beach. This beach is even more calm and tranquil than the Colva beach. The Benaulim Beach provides a prospect to see the lovely nature in its emotionally enriching form, with virtually no disturbance from the outside world. While wondering around, one can spot age-old Portuguese homes still standing on the shore. By Air : The nearest airport is at Dabolim, which is 29 km away from Panaji and 68 km from Colva. By Train :The nearest railway station is at Karmali, 11 km away from Panaji. Panaji is 39 km away from Colva. By Bus :There are frequent buses from Colva running to and from Margao (also Madgaon; 6 km away) from where one can take a bus to Panaji, which is 33 km further ahead.